Shazwani Hamid's Blog: Proton VIP Part 2! Hey guys! Remember last time I blogged about Fadly, the owner of Proton Saga who entered the "My Proton Makeover" program?? Well well well.... I have a great news to tell you guys!! He has just received his brand spankin' new car and is now driving around a new, polished Proton Saga!!! I am so happy for him! 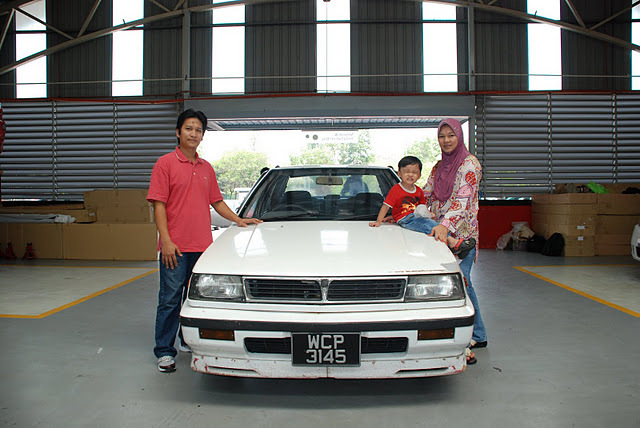 He has been driving around his old Proton Saga for about 19 years..and the car has been very worn out, so he had his 1992 Proton Saga specially treated by the R3 unit of PROTON Motorsports Division. Fadly and family getting ready to drive into sunset! Congratulations Fadly, enjoy your brand new Proton Saga! Awww...congratulations Fadly! I'm really excited and happy for you! Anyway, it is still not to late for you guys to enter this contest and be lucky like Fadly, as PROTON is still looking for owners - regardless of their Proton model - to share their story involving them and their Proton car. It could be your first ever car since college, inherited from their parents, or maybe a second hand or third hand purchase; how their journey through life with the car has been and how the car has played a role, or has a particular impact with their life. PROTON will then identify the best stories - or most heart-warming or heart-wrenching, and depending on its details, will reward the chosen five winners with a complete makeover of their Proton car. You can log in and register at www.protonVIP.com or visit the nearest PROTON Sales and Service centre. Entries close on December 28, 2011. So if you have an interesting story about your PROTON car, do share it with us and take that chance to be rewarded!!! ada sesape nak beli used BB?? Hello everyone!! Check it out the photos on the "Malaysian Firsts Photo Contest"! I think they're all pretty amazing! Start uploading your very own photo now! The most creative fan will stand a chance to win yourself awesome prizes! Good luck!